You are currently on: How does our environment, culture and cognition shape our ability to solve today’s global challenges? 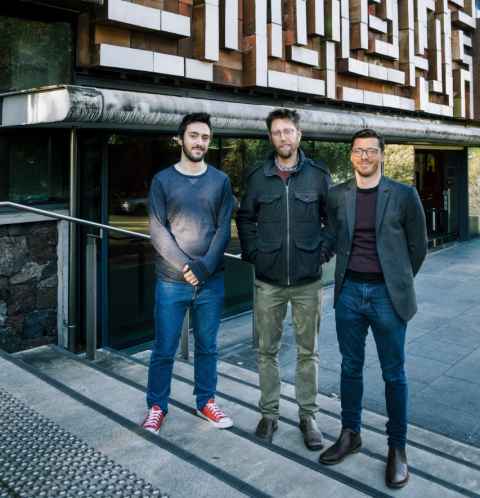 Professor Quentin Atkinson (centre) and Dr Alex Taylor (right), Co-directors, Language, Culture and Cognition Lab, with Thanos Kyritsis, doctoral candidate, Psychology, Faculty of Science. Understanding when and how humans cooperate to solve collective problems is critical both for unravelling our evolutionary past and for tackling the challenges of our future. The long-term survival of our species rests on our ability to cooperate to sustainably manage common resources like our fisheries, forests, water and atmosphere. But how do we achieve this? A major research theme within the Language, Culture and Cognition Lab aims to identify the factors that promote human cooperation. This work includes field and lab-based experiments examining how certain cues, cultural norms and institutions affect pro-social behaviour, social network analysis of the spread of pro-environmental behaviour and computer modelling work on how cooperative norms and ideas diffuse around the globe.